Engjellushe Morina joined Berghof in early 2016 and is part of Conflict Transformation Research Program focusing on the Prevention of Violent Extremism (PVE) in the Western Balkans project and part of Dialogue Mediation and Peace Support Structures Program where she manages the 1.5 Track Dialogue Project in Macedonia. She brings over sixteen years of praxis and research oriented work experience in Kosovo and the region (as well as UK, Egypt and Italy). Engjellushe co-founded and chaired Prishtina Council on Foreign Relations, a think tank focusing on foreign and security policy of Kosovo and the region. She also ran a policy oriented, socio-economic-political think tank in Prishtina for over five years. 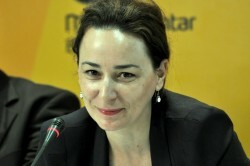 During the high level negotiations between Kosovo and Serbia, regarding Kosovo’s political status, she served as an expert and consultant for the protection of Cultural and Religious heritage within the Unity Team (2005-2007). In recent years she conducted academic research in the areas of non-state actors and religious associations as governance actors (case of Hezbollah in Lebanon), and the role of EU External Action Service in facilitating negotiations between Kosovo-Serbia and Talks with Iran. Engjellushe holds degrees from University College London (UCL), Oxford University (Somerville College) and Hertie School of Governance in Berlin.